The Stepping Stones have been created for the really young ones (age 4-8). The content of the two workbooks partially overlap the basic Step 1. Part one of Stepping stones corresponds to lesson 1 to 6 of the manual Step 1, part two begins with mate. 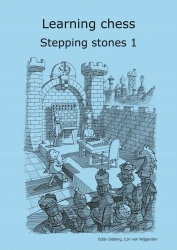 After finishing Stepping stone 2, a student can continue with Step 1 extra/plus or the basic Step 2. The answers of the workbooks can be downloaded from our site. See 'workbook answers' in the menu.